Isabel Martindale looks after Thursday mornings at the Youth and Community Centre which is by Fitzmaurice School. We have lots of space and often set up as many as five tables. The U3A recently bought a new table which is left in the centre and may be used by others in the community. We have a reasonable supply of bats but some people prefer to bring their own. Each person contributes £2 per morning. We are lively, very informal and have immense fun. There is a lot of chatting and socialising that takes place as well as playing. 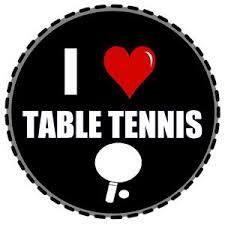 There is no particular standard of play expected and beginners are more than welcome. We’ll take care to ensure that people are fairly evenly matched so that no-one either gets nervous on the one hand or deprived of a good game on the other. Back in April, we entered two teams in the Fitzmaurice School Table Tennis Challenge fundraiser for their solar panels. The aim was not to win any points but simply to keep the ball in play for as long as possible and tot up as many balls successfully over the net as possible within an hour – working in two-person relays. We had a lot of fun with one of our teams winning overall and the other placed second.